IN SILICON valley’s ride-hailing duo Lyft has always been the wacky one. Uber, its far-larger competitor, opts for sleek black for its brand; Lyft likes hot pink. Most Uber drivers concentrate on driving; Lyft has long encouraged its drivers to decorate their cars, handing out fluffy, three-foot-wide pink moustaches for them to pin to their grilles. One driver in Los Angeles used to keep a magnetic word-board in the car, encouraging passengers to use it to compose little poems as they travel. “My diamond apparatus is a chocolate storm,” ran one typically mystic opening line. Lyft got more serious on March 1st, filing a (pink) investment prospectus with the us Securities and Exchange Commission and becoming the first ride-hailing company to show the world its detailed financials. They are striking. The prospectus shows a young company with revenues that surged from $343m in 2016 to $2.2bn in 2018 and costs that also ballooned, from $1bn to $3.1bn. 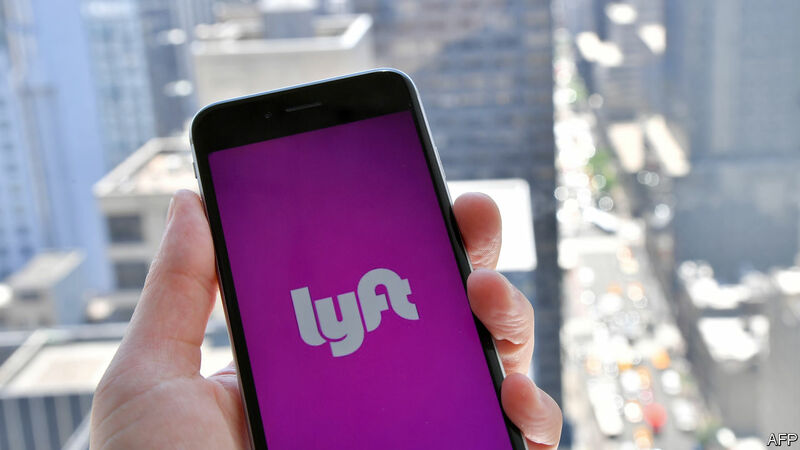 Lyft is expected to list on Nasdaq in April, at a valuation of around $20bn, having lost nearly a billion dollars in 2018. Its hope is that investors will see past the losses to a bright future—in which Lyft transforms the way people get around. Lyft’s filing is also the starting gun for a succession of tech ipos in 2019. Uber, Pinterest, a social-media firm, and Slack, a messaging company, are all expected to follow suit this year. All will be relieved that the public markets have taken a kinder view of technology firms in the first quarter, after hammering them at the end of 2018—and will hope for a successful debut for Lyft. Uber’s boss, Dara Khosrowshahi, called it a “big moment for ridesharing”. That the company is filing while still losing money is now the norm for technology firms going public. Still, its gigantic losses make a sharp contrast with the circumstances ofipos from earlier on in the tech boom. Google, for instance, had been profitable for three years when in 2004 it offered its shares. In the three years before ipo, Google’s annual revenues had grown on average at a rate two-and-a-half times faster than those of Lyft. Of all the big five tech companies (also including Facebook, Microsoft and Apple) only Amazon was loss-making when it went public. But huge losses are particularly hard to avoid in ride-sharing. Lyft’s speedy revenue growth is entirely dependent on its gigantic costs, a good chunk of which are spent subsidising rides to lure customers onto its app, away from competitors. In 2016, for example, Lyft spent more money on sales and marketing alone—$434m—than it earned in revenue, its filings show. Ride subsidies are the primary weapon that Lyft and Uber employ to battle each other in the American market. Lyft’s gentler image has also helped, after a bout of bad press damaged Uber’s reputation, and Lyft has been benefiting since, winning market share from Uber at a rapid clip, particularly in cities on the West coast. Data from an independent consultancy, Second Measure, show that Lyft has 29% of the ride-hailing market in America (Lyft itself puts it higher, at 39%). The figures from Second Measure also demonstrate that the rate at which Lyft is pinching Uber riders slowed in 2018. Still, Lyft’s growth in the past two years has been sufficient to see it established as a true competitor to Uber in North America. Is there a route into the black for both firms, and for other large, private ride-hailing companies such as Didi of China, or Grab, which operates in South-East Asia and which Uber owns? Lyft’s filing offers plenty of clues. The firm carefully outlines two (overlapping) ways to reach profitability. One is to build new lines of business on top of its existing platform. Lyft is already doing this; it has given users the ability to rent scooters and bicycles through its app. The company also plans to let people plan trips on public transit through its app (though this feature is currently only available in Santa Monica). The idea is to turn Lyft into the one app through which users plan and pay for travel around urban areas. Another path to profitability is to bypass ride-hailing’s biggest expense: drivers. The scale of the cost is illustrated by the fact that Lyft took a whopping $8.1bn of bookings in 2018 through its app, for revenues of $2.2bn. The difference, of $5.9bn, went to Lyft’s drivers. Having cars driven by software would dramatically lower that cost. Much of the resulting gain could be claimed by a price war between operators of autonomous- vehicle fleets, but capturing even a small proportion of it would swiftly make Lyft and other ride-sharing firms profitable. To that end, a good chunk of the $300m that Lyft spent on research and development last year went on research into autonomous vehicles. Lyft is developing its own technology and says that it aims to have deployed a “low-cost, scaled autonomous vehicle network that is capable of delivering a majority of the rides on the Lyft platform” within a decade. Within 15 years, Lyft wants to deploy autonomous vehicles specifically designed for different sorts of long- and short-haul travel. This might mean cars that are built inside to resemble offices, to suit working commutes, or like bedrooms, letting people sleep while the car drives itself.